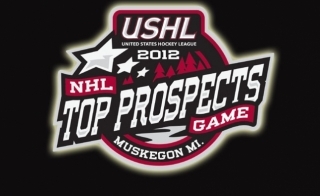 Just a reminder, the USHL will be holding its 2012 USHL/NHL Top Prospects game tonight in Muskegon, Michigan. The puck will drop at 6:15pm CST. Click here to view the Pointstreak boxscore. The game will be broadcast for free by FASTHockey.com. Viewers can watch the webcast live via multiple formats – the USHL’s Facebook page, through a previously established FASTHockey account, or Roku users can watch the game on the platform’s USHL channel. To view the USHL free game broadcast, fans must first register and create a free account on FASTHockey http://ushl.fasthockey.com. Facebook users should “Like” the USHL Facebook page and log in to their FASTHockey account using the “USHL on FASTHockey App” to watch the game. Players from the Lincoln Stars who will participate tonight are forwards Zach Aston-Reese, Luke Johnson, Kevin Roy, and defenseman Mike McKee. Stars head coach Chad Johnson will be head coach of Team West. Click here to see the full rosters of Team East and Team West. Tune in at 6:15pm CST tonight! Good luck to Zach, Luke, Kevin, Mike, and Chad. Go Stars, and go Team West! If you didn't catch this game, Team East beat Team West by a score of 5-3. Stars forward Luke Johnson finished with two assists.